Get it while it's hot! Save an additional 20% off all sale items with our Labor Day Sale! Use code LABORDAY at checkout and enjoy the massive savings. Sale starts Thursday, September 1st at 12 AM and ends Monday, September 5th, at 11:59 PM. Promotion online and in-store. Not applicable on previous orders. 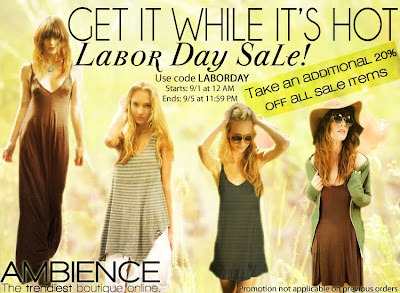 Only at www.ShopAmbience.com!